We are honored to be the “featured blog of the week” this week over at The Born Again Vegan’s page. We know the BAV personally, her name is Chris, and we’ve had the privilege of photographing her and her lovely greyhound in the past, too, at the annual Grapehounds event in New York. While Chris was always vegan-friendly, she recently took the steps to commit to a completely vegan lifestyle. She’s seen great results. Her cholesterol has dropped 105 points since she made the switch to vegan (previously, she was eating lacto-ovo-pescatarian), and she feels better than ever! We’re honored to be featured on The Born Again Vegan blog, Chris! If there is ever anything we can do to help you or your readers on the plant-based path, do not hesitate to ask! Earlier this year there was a vegan mac-n-cheez throw down in Baltimore. No, Bobby Flay didn’t show up, but he honestly would have had no chance with all the amazing vegan chefs in the house. We threw our hat into the ring (or should I say, our mac-n-cheez? ); we made it several times to test the recipe. But we didn’t win. We didn’t end up last, either, which was nice. The Bake-Off was hosted by The Baltimore Animal Rights Federation. About twenty cooks showed up with recipes as varied as gluten and soy free to those featuring sriarcha, Old Bay or mushroom-bacon. Our hosts appointed judges from various Baltimore vegan restaurants, and 3 prizes were awarded: first, last and people’s choice – which was done via voting ballots. Because we are always game to eat way too much food, we both sampled every mac in the place. They were all good and I didn’t envy the judges. The recipes were so different, it was like comparing apples and asparagus. We bake mac-n-cheez fairly often, but on most days, we rely on Daiya or Teese to make it happen. For this recipe, we decided to go whole-food and use as few processed ingredients as possible to challenge ourselves for the contest. Everyone knows how delish & gooey Daiya and Teese are; that’s too easy. We wanted to use more veggies, too, to up the nutrition content. After several tries, we were pretty happy with the recipe. We tested it out on vegans and non-vegans, and got good reviews from both. Even my Dad liked it – he went back for seconds! This recipe is more complicated than others we post, as it requires several advance steps and a few unusual ingredients. First, you will need to make the roasted garlic in advance, as well as soaking the cashews. We have posted a great method for roasting garlic, but if you forget, no biggie. Just use regular garlic – the roasted garlic does have a different taste and aroma, however, and your results will be sharper and more “garlicky” with raw garlic. Still good, though. But the cashews need to be soaked to be soft enough to blend into a sauce. Ideally, you can soak them overnight or all day. As for the unusual ingredients, you may not have worked before with ume plum vinegar or kuzu root starch. We were introduced to both during our stint on the macrobiotic diet, and once you meet these two, you’re going to love them. Ume plum vinegar is the pickling brine from making umeboshi plums with sea salt and red shiso. A tart, salty, condiment with beneficial organic acids, ume plums are ‘the king of alkaline foods’, and highly valued as a digestive aid in macrobiotics. Kuzu root starch is a thickener that dissolves in cold liquid and has no perceptible taste. It is very low in calories and contains no fat. Kuzu binds more strongly than arrowroot. Unlike corn and potato starches (industrially processed) kuzu is handcrafted and natural. The kuzu Pueraia lobata plant is a prolific, tough, fibrous vine with heart-shaped leaves used as a food in China for more than 2,000 years. Its roots are among the largest in the world, ranging in length from three to seven feet and weighing between 200 to over 400 pounds. In traditional Oriental medicine kuzu is valued as a digestive aid, to strengthen vitality, and fortify the body in cold weather. Recent studies have shown that Kuzu may reduce the cravings for alcohol and aid in recovery from alcohol addiction. You can find these two unique ingredients at any Maryland-area Whole Foods or Roots Markets, as well as online – try Amazon. We always buy Eden Foods brand. Once you try them, you’re going to love ume plum vinegar (wonderful splashed over steamed greens) and kuzu root starch (try it in apple pie as a thickener!). Before you begin, make sure you have roasted your garlic and pre-soaked your cashews. Even if you decide to skip the roasting of the garlic (will slightly alter the flavor), the cashews need to be soft before you begin to make a smooth sauce. Preheat oven to 400. Grease a casserole dish with olive oil or coat with non-stick spray of choice. Start by adding kuzu to cool water and stirring it up. Next, add your chopped cauliflower and carrots to a large pot and boil until just soft, about 10-12 minutes. Use a fork to test, as they don’t need to be mushy, just tender. Allow to cool for a few minutes in a strainer. Next, cook pasta with oilve oil and pinch of salt according to directions. When done, strain and set aside. Using a food processor or high-powered blender, puree soaked and strained cashews with dissolved kuzu in water, peeled & roasted garlic cloves, dijon mustard, almond milk, miso, Braggs Liquid Aminos, white pepper, ume plum vinegar, vegan Worchestershire, smoked salt and nutritional yeast. Resulting sauce should be very thin. Add cooked cauliflower/carrots 1/3 batch at a time to the cheezy sauce and puree until smooth and creamy. When all veggies are mixed in, combine cooked pasta and cheezy sauce until all the noodles are coated. (You can mix it in the casserole dish!) Top with sprinkles of panko bread crumbs and smoked paprika. Bake, covered, at 400 for 35-40 minutes until bubbly. Remove cover and bake another 15 minutes to toast the top. Allow to cool on counter about 15-20 minutes before serving. Optional: If you like things spicy, trying adding cayenne pepper to the sauce. To amp up the veggies in this recipe, try topping with fine-chopped broccoli or sliced tomatoes when you add the breadcrumbs and paprika. 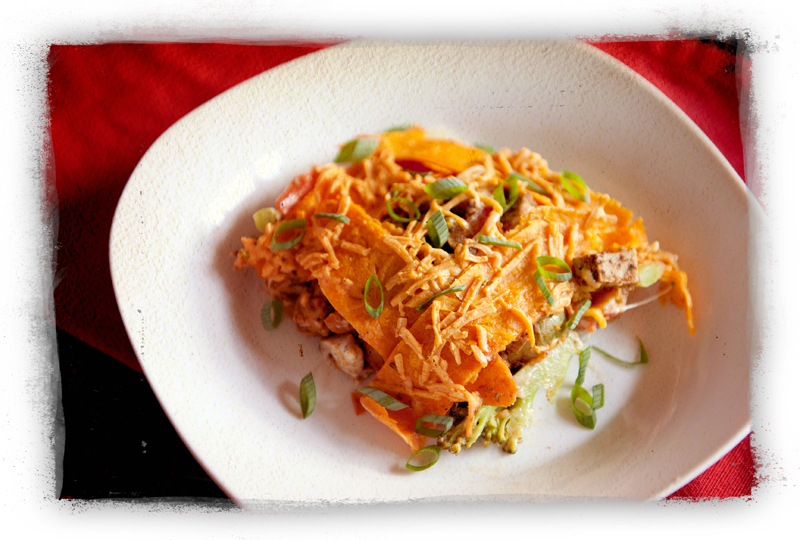 A special thanks, before we sign off, to The Baltimore Animal Rights Federation for inspiring us to get in the kitchen and create this tasty recipe! 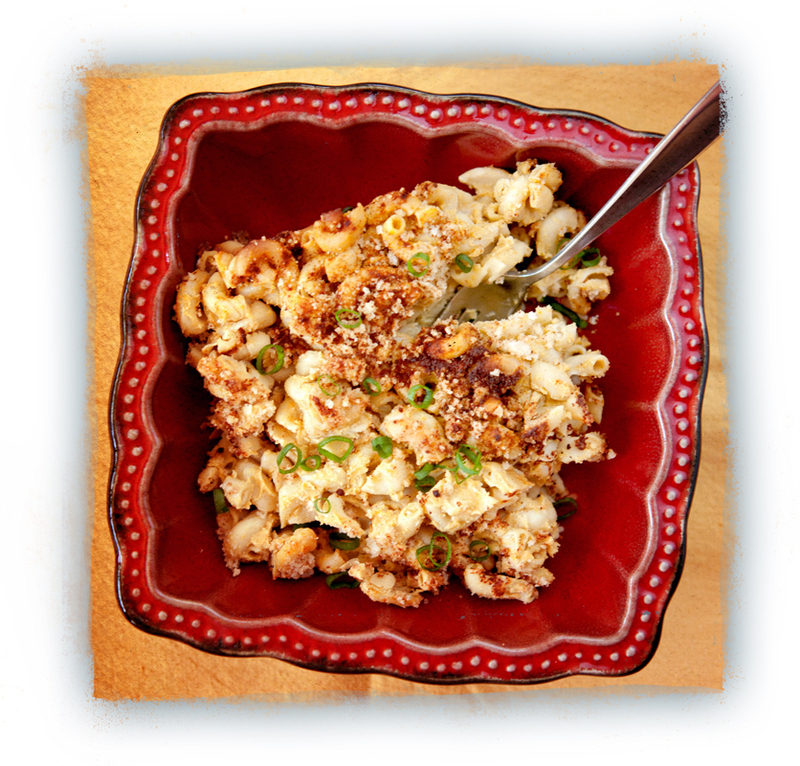 Oh, and Bobby Flay, if you’re out there – we’re ready for the vegan mac-n-cheez throw down! Nothing is as soothing as the elegant fragrance of burning petroleum. Wait – that’s not right. Which is the reason we pass by most candles these days. Why support the petroleum industry any more than you have to? Especially when there are great alternatives for other candles. Like River Road Candleworks, run by Delaware artist & craftsman, Mark Turner. We met Mark first through his work with greyhound rescues. Already a man after our own hearts, he loves his hounds, and all animals, and many of his paintings are themed with nature and critters. When you purchase or commission animal-focused paintings from him, he makes a donation to rescue groups. Love it! Someplace along the way, Mark started making soy candles, too. And we find them to be just as fabulous as his artwork! The candle company is called River Road Candleworks and is a picture of sustainability and ethics. Some folks trying to sell you ‘soy candles’ aren’t using eco-friendly, sustainable 100 % Soy Wax! Many so-called soy waxes use ‘botanical oils or ingredients’ to enhance the look or performance of their products. Guess what those might be…. Many include Palm Wax made from palm oil. Palm oils come from palm oil plantations…most of those are carved out of the tropical rainforest – which destroys rainforest habitat… My guess is that you want your candles to be as eco-friendly as possible. That doesn’t include using non-habitat sustaining palm wax in your candles. 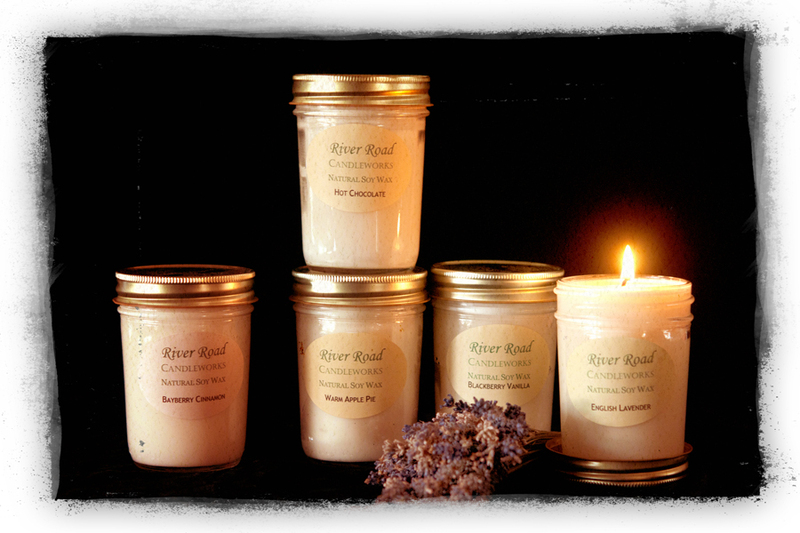 River Road Candleworks doesn’t use any extra ‘Stuff’ in your candles. We don’t use any polymer additives. We don’t use any dyes. We don’t use any chemical stabilizers for our scents or in our wax. We don’t use any ‘universal soy additive’ (USA) in our wax. Our wax is 100% soy. We use Elevance C-3 NatureWax, not any of the other soy blends or vegetable oil-based waxes. As you may know, palm oil is non-sustainable for another reason too – when companies kill the trees, they destroy the habitat of many endangered species, including orangutans. Read more here and just say no to non-sustainable palm oil! Furthermore, Mark will recycle the jars from his pure soy candles! For each jar you return (with or without the lid), Mark will credit you $.25 towards your next purchase. Again, love it! Mark’s event schedule is online here, so you can get candles from him in time for the fall and winter holidays. Or just order online! When you are shopping around, our favorite scents are lavender, clove, citrus spruce, hot chocolate, pumpkin and olive tree. Mmmm! Of course, we haven’t had any River Road candles yet that we didn’t enjoy. They make perfect gifts, too! Thanks, Mark, for making a sustainable and great-smelling candle! If you’re a vegan living under a rock for the past year, you may not heave heard of Beyond Meat. It’s a faux meat product that looks, feels, tastes and acts like cooked chicken – but it’s 100% vegan, non-GMO and gluten-free, and the inventor is a native of Maryland. We first tried Beyond Meat over a year ago at the Roots Market stand during DC Veg Fest 2012. A lot of other vegans in the crowd weren’t sure about it – after all, it really DOES look and feel like real chicken. Even TV Chef, Alton Brown has endorsed the product. 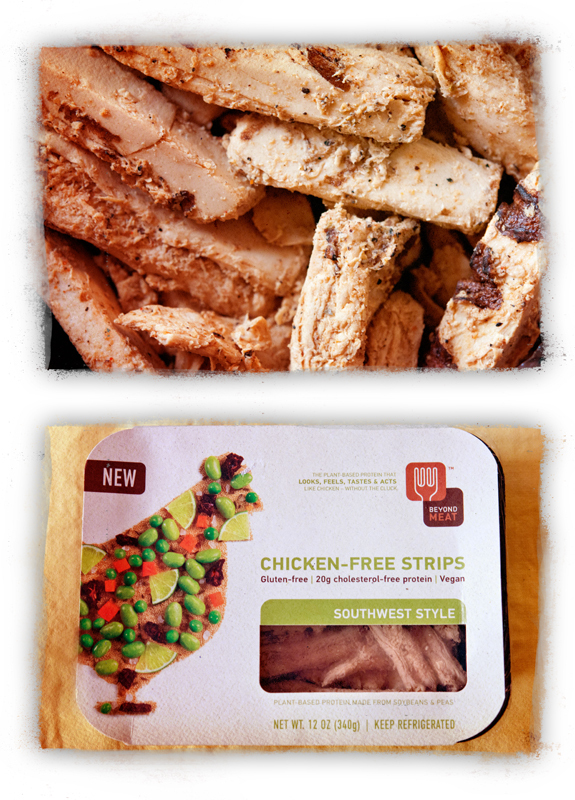 Unlike any other meat substitute we’ve encountered, Beyond Meat has a convincing taste and texture. Your friends and family who think vegan food is “weird” are going to love this. In fact, you can likely fool them. We know several folks who have tricked meat eaters with Beyond Meat. The company has a conscience, too. Their packages encourage recycling and clearly states commitments to human health, reversing climate change, conserving nature and respecting animals. Gotta love that. In pretty much any recipe that uses chicken, Beyond Meat will make the switch. I mean, obviously not a whole-bird roast – you have to be practical! 🙂 But if you have an old family cookbook like I do, you can easily use Beyond Meat in many of your mom and grandmom’s favorite chicken recipes. It hold ups well during prep, doesn’t get mealy or fall apart with cooking and takes on flavor smoothly. We have tried Plain, South West and BBQ flavors. It’s available at Roots Market, MOM’s and Whole Foods so far. Oh, and this product makes a mean chicken-less salad. Pack some in a wrpa for lunch – your co-workers will envy you! For this post, we made a casserole. It’s ideal for feeding a crowd, and would work well a potluck over the holidays, especially one catering to both vegans and omnivores. Preheat oven to 375. Use olive oil to grease a casserole dish and set aside. In a large pot, steam broccoli and onions until just soft, about 3-5 minutes. Strain water, and shock in an ice bath to preserve the green of the broccoli. Set aside. Toss the chopped Beyond Meat with chili powder and garlic powder; add in tomatoes and peppers. Stir together vegan cream cheese and flour to make a thick paste. Begin to layer the casserole: first, add broccoli and onions. Dot with cream cheese/flour combo. Next, pour on Beyond Meat layer with the tomatoes and peppers. Weave the tortilla strips on top, over-and-under to make a basket-like pattern. Or you can just lay them across if you aren’t feeling artsy. Load on the 1/2 bag of vegan cheddar shreds. Bake for 20 minutes at 375, uncovered. The casserole will be bubbly and the cheddar shreds will melt. Allow to sit on the counter-top to cool about 15 minutes before serving. 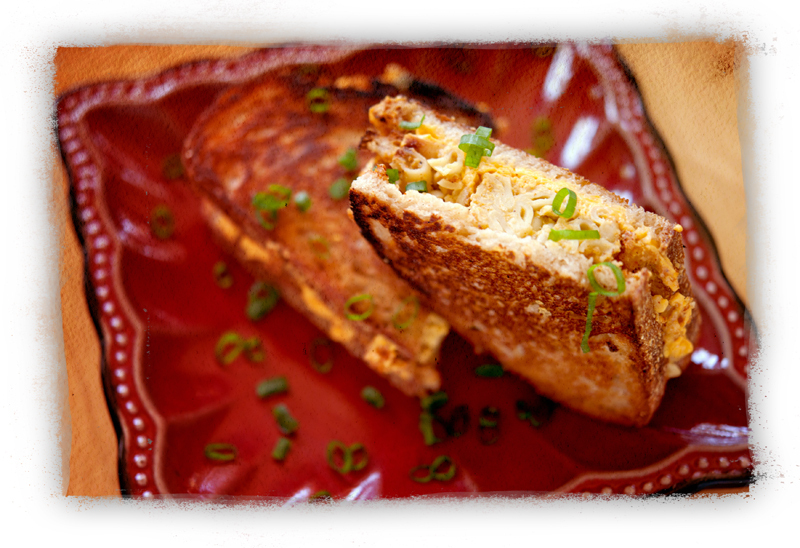 Top with green onions and siracha, as desired and enjoy! OH – and be sure to notice that Beyond Meat! It will add a chewy, hearty texture and give your casserole unique substance, sure to please the fussiest eater! UPDATE: Beyond Meat is offering a FREE year of product to one lucky winner THIS MONTH! So log onto their site here to get all the rules and regulations. Good luck! Fall means bonfires. Bonfires mean s’mores. Everyone knows the luscious, gooey goodness that is a melted marshmallow, all squished between softened chocolate and graham crackers. But sometimes, though you just can’t set up a bonfire, the longing for a s’more goes on. 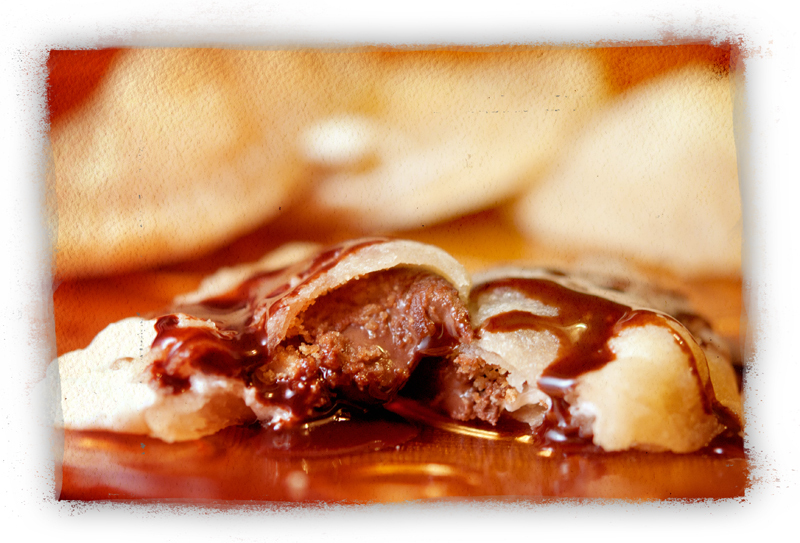 Enter the s’mores hand pie. We were lucky enough to develop this recipe with our friend Kristin, who blogs at High Impact Vegan. She is something of a s’mores expert – knowing the specifics that only a true connoisseur could appreciate like just how melty the chocolate and marshmallow should be, the perfect moment to eat a s’more – between hot and too cool, and the right amount of each ingredient for perfect s’mores balance. Basically, we had a blast making – and eating – these treats with Kristin. Make the dough first. In a stand mixer or with a hand-held mixer, cream together the vegan cream cheese, Earth Balance and vanilla soy creamer. When it’s smooth, add in the powdered sugar, flour and salt. Don’t overwork or the dough will get tough – mix until just combined. Transfer the dough to parchment or wax paper and roll up. Chill in freezer one hour or three hours in the fridge. You can keep it in the fridge overnight. Just so that the dough is firmed up when it’s time to roll the hand pies. To make the hand pies, preheat oven to 350. Sprinkle a flat surface with flour and roll about half of the dough to 1/4 inch. Use a wide jar or large cookie cutter to make big circles, about 3 to 4 inches in diameter. Transfer circles to a parchment-lined cookie sheet. Top each circle with one teaspoon of chocolate nut butter, followed by a sprinkle of graham crumbles and a half vegan marshmallow. To seal the pie, brush almond milk around the edge and fold in half to close. Crimp edge of hand pie with a fork and brush top of hand pie with more almond milk, then sprinkle with sugar. Repeat until all dough is used. Bake 12 minutes until dough is golden brown. Allow to cool at least 10 minutes before eating! They will be warm and gooey, but not too hot. The pies are tastiest eaten warm, but we didn’t hesitate to devour the leftovers from the fridge, either. You may wish to serve these with a tall glass of soy or almond milk, or perhaps some cocoa.